Applicative for oil and air. Can be installed in any position. Temperature range: -30 °C to 100 °C. A current regulator keeps the volume flow from E to R constant, independent of viscosity and pressure fluctuations. 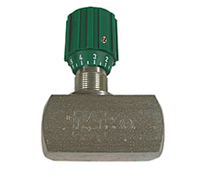 The non return valves provides free flow in the opposite direction, R to E.
The current regulator makes it possible to provide a selectable constant volume flow at connection R. Constant volume flow is mostly independent of load pressure and input. Excess residual current transmits to connection T and is not resilient. 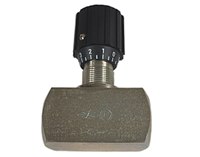 The current regulator is used to supply two divided hydraulic circuits via a hydraulic pump. It is possible to access a selectable priority flow at connection P, while at connection B only the difference (E minus P) is accessible. Connection B will get supplied with oil, once the demand of constant flow at connection P is covered. Both exits B and P are loadable. It divides incomming oil flow (v) in two even partial currents (C1 and C2), independent of the load pressure. If the flow direcetion gets reversed both partial currents (C1 and C2) will add up at the same ratio.